The Odenwald region of Hessen was a stretch of forests and rollings hills between the Main and Neckar Rivers off the east bank of the Rhine. A few secondary roads wound their way through tight valleys, connecting together several tiny villages. Many of these had a castle ruin or small palace built on high ground overhead. Forest trails were common and attracted small throngs of walkers looking for fresh air and exercise. There was industry (such as timber and mineral water) in the larger towns further north toward the flatter, open lands toward the Main, but otherwise much of the area was sparsely inhabited and left natural. The Odenwald had a lot of walking trails. 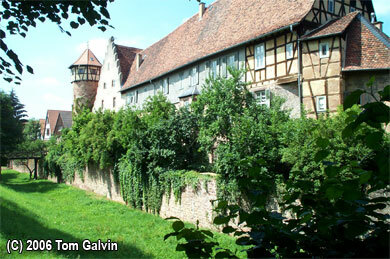 In this peaceful setting sat an old medieval town embracing a small river among open, flat ground. 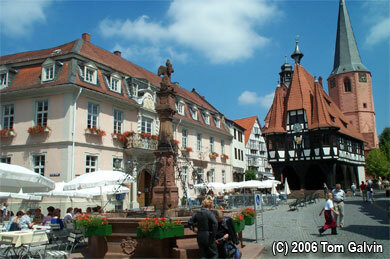 This town was Michelstadt, one of the prettiest places in Hessen and also one of the best preserved. Complete with bright half-timber houses and a largely intact city wall, Michelstadt's charming downtown was colorful, picturesque and historic. Its old town was also not very big, perhaps only a few city blocks l arge, so it could be enjoyed at a leisurely pace without missing anything. Getting to the old town was pretty easy, following secondary road B47 either north from Erbach or south from Darmstadt. 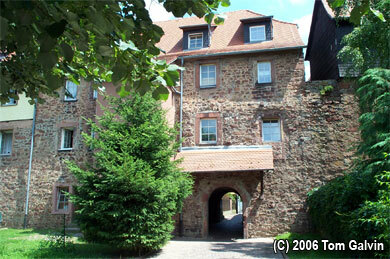 (On the way you will see how much Michelstadt has expanded and modernized over the years.) There was a huge parking lot near the entrance through the city wall, shown in the first photograph. This parking lot was absolutely massive, big enough to handle the tens of thousands of visitors that descended on the town during its terrific annual Christmas Market. The parking lot had a massive hand-painted sign that contained an old original drawing of the downtown with Michelstadt's history provided in German. Following a narrow path across the street in between some houses brought us to the gate and into the town. 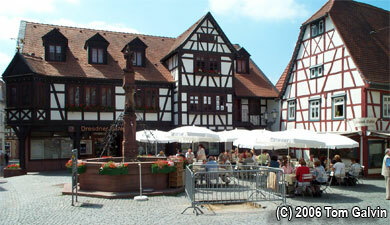 The second photograph was what I considered to be the classic Michelstadt "postca rd" shot, showing the main market square with the four of the town's major landmarks -- the city fountain, the pink New Town Hall (Rathaus), the half-timbered and elevated Old Town Hall, and the Pfarrkirche (Reformed Church) whose red-brick steeple is in the background. The Old Town Hall was the most interesting because the front was built on stilts with the area underneath exposed and in the open. Presumably, that area would have been for meetings, nowadays it was reserved as a place to display some city artifacts (including several very old engraved sandstone tablets). The interior of the Pfarrkirche was bright white with a modern touch that suggested a recent renovation. The remainder of the market square, shown in the third photograph, consisted of guesthouses, restaurants, and souvenir stands. All of these were very brightly decorated, and the restaurants offered mostly traditional meals. I was fortunate to do lunch right before the after-church crowd descended upon the market square and crowd the restaurants. 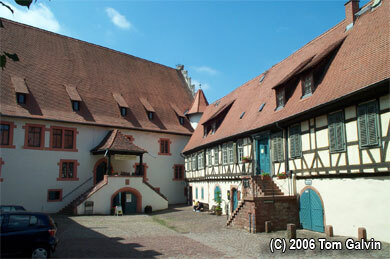 Michelstadt was very proud of its history, and had several museums and points of interest worth visiting. The fourth photograph shows the Hessian Museum, located in an old barn-sized building about a block away from the main market in Museum Square. For only a couple Euros, visitors to this museum got a very thorough history of the state of Hessen and the Odenwald region (mostly in German, however). There were static displays of regional dress and furnishings, and a whole wing devoted to toys and dollhouses locally produced back in the 19th century. At the opposite end of this square was a wheelhouse where visitors could view the old watermill that still ran but only for display purposes. In another part of town was the Old Brewery House, still in operation as a public house and restaurant. Several buildings beyond that was the old synagogue which was still in use, but whose front foyer was converted to an open museum (free of charge, but taking donations) telling the story of the Jewish community in Michelstadt before World War II. I felt the nicest historical part about Michelstadt was the city wall itself, that surrounded almost the whole downtown and separated it from the rest of the town via a dry moat, now part of the town park. The fifth photo shows one stretch of the wall with one of the observation towers visible. Some parts of the wall, as suggested in the first photo, were built into part of residences. I also made note of the very decorative cobblestone roads, particularly near the entrance gate, that made the old downtown feel very inviting. It was terrific walking around the maze of roads away from the market square. It filled the imagination with all sorts of pictures of what the place was like back in the old days. With Erbach and its grand palace being so close by (maybe two miles away), the two towns together were a great way to spend a full day, especially if you take the time to visit the museums and go leisurely along the secondary roads through the Odenwald leading to and from these towns. For me, that was a perfect way to enjoy a quiet, sunny Sunday in the middle of summer.